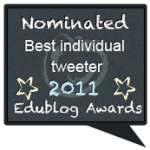 Social Media In Education …Not convinced yet? As the years pass social media tools like ( Twitter, Facebook, youtube...) are being used everyday as a means of communication and information sharing and its becoming an integral part of the lives of today`s " Digitally Savvy" Students, shaping their attitudes and personality. Its simply that kind of medium that students are already familiar to and obsessed with...they just love it! With all these facts & others that we can`t deny, and as teachers ..Can`t we see some benefits in embracing it? can we exploited these tools fully and harness our student`s passion towards it? in order to deliver curriculum through it, and improve our students` skills? can we just twist it to a sociable learning and teaching tool? The answer is yes , we actually can..In fact social networking goes to schools and has already found its place in the classroom. - Social media can be a valuable and effective teaching tool as more teachers, school leaders and principals are embracing it and becoming more aware of it. - There are a hundreds of inspiring ideas and more on how to use social media in the classroom everywhere on the web. - Having a lot of free social media tools for students and even for kids, in addition to some tools that are only designed for education, will surely encourage schools to use it. - A lot of educators believe in the power of embracing it. - Social media is the future of education. - Social media, like the Internet, will be a part of our world for a long time.Its better to teach it than to fight it. - It can help building the 21st century skills for students. - Social media is changing education. - Education is based upon relationships. - Social Media is not going away! For all these reasons and more! , if you`re not embracing it, you`re missing out on a lot!. So lets end the social media debate..Get connected and make a difference! Check out what has my PLN shared about Social Media on Twitter! 17 Responses to Social Media In Education …Not convinced yet? A very interesting read and a great post alltogether. thanks for sharing this information. Future of social media marketing is always going to be brighter than the present. Social media should be mandatory to learn in every school and colleges. Thanks for sharing the informative blog post. giving out such a good article.. I enjoyed reading your articles. are among the best information. was the most complete that I found anywhere. Here I got some great Social Media Marketing Tips. It will help lot's of new social media marketer like me. Thanks for sharing the great information.The clarity in your post is just great and i can assume you're an expert on this subject.This is a really well written article.I am hoping to give a contribution & aid different customers like its helped me. Good job. Millions of people actively use social media platforms on everyday basis so this is a good opportunity for the brands to target those people to generate business leads. I think Fb is the most used platform in the US so I am going to hire facebook ads management services in order to sell our handmade jewelry items. Thank you for sharing your tips! This is very helpful and informative! I’m looking forward to seeing more updates from you. Your e-library for " Social Media In Education "